Join the Nova Southeastern University (NSU) Jacksonville Campus on Saturday, April 27, 2019 from 9:00 a.m.-2:00 p.m. for “School Violence and Prevention Conference: Lessons from the Front Lines”. It is essential that schools know the incidence of school violence and be up-to-date on the best safety and prevention practices. This presentation will review numerous national initiatives that have focused on school safety and the recommendations from a variety of foundations started by parents who lost their child in tragic school shootings. Lunch will be provided. This event will be held at the NSU Jacksonville Campus located at 6675 Corporate Center Parkway, Suite 115, Jacksonville, FL 32216 and is free to the general public. 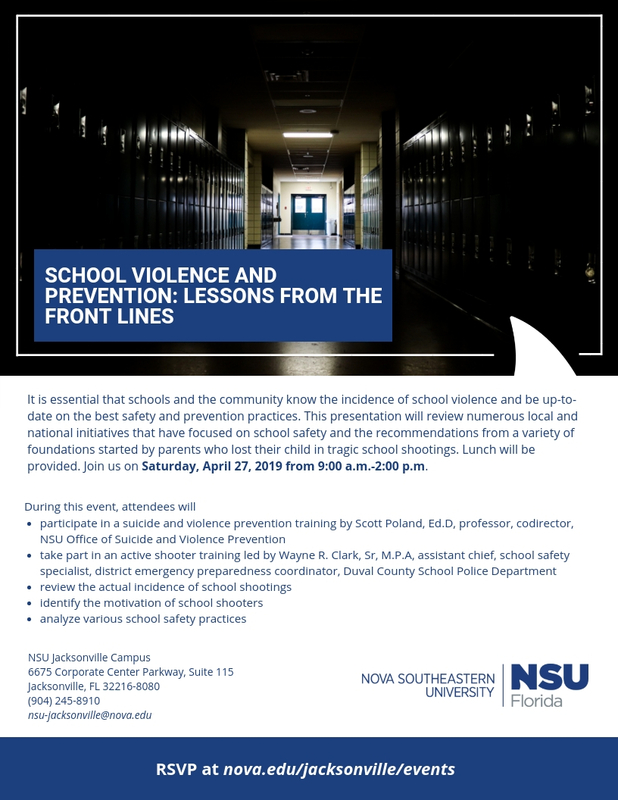 Please RSVP at nova.edu/jacksonville to attend. For more information, contact the NSU Jacksonville Campus at nsu-jacksonville@nova.edu or (904) 245-8910.